When I first bought RPG back in the summer of ‘96, I’d never played an role playing game before. I don’t even think I knew that this game WAS an RPG. I remember picking it up for two reasons: 1) because the cover was awesome looking; it has all these bright colors and looks very enticing - and 2) I wanted to make my friends jealous. When I got the game home, I popped it in and I was pleased with it’s opening, music, and interface. One thing, though, left me confused; what was with this whole "battle system"? The concept of taking turns to fight each other was new to me, and it left me scratching my head as I tried to follow along with the guide I bought. Twelve years later, I decided to play the game and take it seriously. I was trained at RPGs with good ol’ Final Fantasy VII, and have been a snob when it comes to RPGs ever since. Some I can play, some I absolutely love, and some I absolutely loathe. So, I set aside an hour or two every night before bed to get some pre-Paper Mario action in. The story involves the Mushroom Kingdom and neighboring territories coming under attack by a new foe by the name of Smithy. Smithy and his gang have control of the Star Pieces after crashing through Star Road, where shooting stars come from when wishes are made. Mario encounters some new and familiar faces on his journey to gain control of the kingdom once again. Geno, a star being sent to recover the star pieces, joins Mario’s gang in the form of a possessed doll to help Mario on his quest (or rather the other way around it would seem). The group eventually confronts Smithy after collecting enough star pieces and defeat him, allowing them to use the final star piece to repair Star Road. First off, the game is great. The presentation and menus are welcoming and easy to understand. 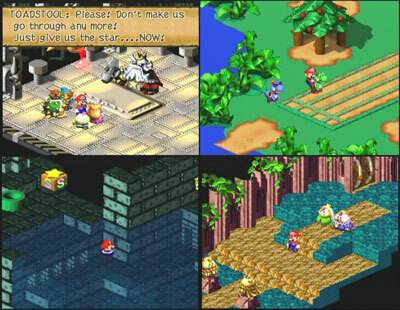 You can definitely tell Square (now SquareEnix) put their classic touches in the game, but they did it with respect to Mario and the Mario universe. The characters are easy to like, even if they never made it to any sequel titles. Likewise, they’re also easy to play with. Each character is well balanced in terms of strength, life, and magic, with each having their own slew of special moves as opposed to sharing or swapping moves amongst other group members. The graphics definitely did the Super Nintendo justice. 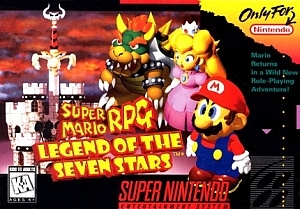 RPG was one of the last games for the console before the heavy hitting Nintendo 64 came out the following year. The color palettes are well blended with good contrast from the background to the characters. It makes it extremely easy to see where Mario is at all times. One of the only gripes I have about the game is that it can be difficult at times to navigate the boards. The camera is fixed at and 3/4 angle above the board, and angled jumps can be difficult to pull off with the gamepad. There are some challenges that come along during the game that involve jumping multiple platforms where I found myself falling off and having to start over. Also, the game actually seemed rather short. I was able to complete it in probably under 10 hours, though I suppose that would be an extensive play in 1996. Overall, RPG was a great experience. Since, to be honest, I hadn’t beaten the game until now, I feel kinda dumb that I didn’t stay more interested at the time. Perhaps my attention span was rather short and I enjoyed clobbering Bad Mr. Frosty with Nanaman instead. No comments yet... get a conversation started! Copyright © Spaghetti Oh dot com | All Rights Reserved.